While selling a home during the holidays can be more hectic than usual, sellers do have an advantage. It’s the perfect time to show your home in the best possible light with strategically chosen holiday décor. While you don’t want to go overboard, by adding just the right amount of coziness and cheer, you can make your home that much more warm and inviting to potential buyers. Here’s how to do it. Before you start decking the halls, be sure to clean out the clutter, as you would normally do when staging your home. This includes removing bulky furniture and storing personal items. The key to remember is that you want potential buyers to be able to imagine themselves in your home. It’s essential that you give them a clean slate from which to do it. Adding some cheerful twinkle lights to your home’s exterior can create a cozy glow. And if your neighbors tend to go all-out with holiday decorations, it does help to show unity. But go with the idea that less is more. While a few strings of light add charm, this year you may want to forgo the inflatable snowman or colorful lights set to music. 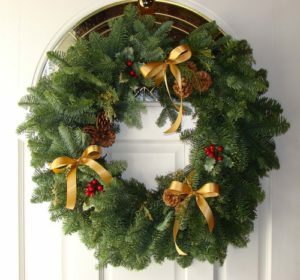 Add some seasonal touches like a pine wreath for the front door or electric candles in the windows that turn themselves on at dusk. If you have a country home, then rustic decorations make perfect sense. But if your home is midcentury modern, you may want to rethink them. Choose holiday decorations that are in keeping with the style of your home. This will enhance your home’s natural features, not detract from them. While you may love having an enormous tree, now is not the time to set it up. Having an overly large tree in your living room can make the room appear smaller – which is the last thing you want to do when showing your home. If you want to put up a tree, keep it small and simple. Don’t use too many ornaments. Elegant and tasteful is best. Though it is the time of year where we celebrate our beliefs, it’s not a great idea to display overtly religious decorations when you’re showing your home. Keep the nativity scene in storage and display festive items that won’t be off-putting to anyone who may have different beliefs. Safe bets include simple silver and gold decorations, a pretty bowl of pinecones, or even a nutcracker or two. Buyers will notice how your home smells and can factor into their decision-making, so now is a great time to bake those Christmas cookies or set out a pot of simmering potpourri on the stove. Just don’t go overboard, or it can be a little suffocating. Opt for clean, natural and warm smells that make your home feel cozy and inviting.